Crab apple tree blight is also known commonly as fire blight or as “Erwinia amyloyora.” This plant disease affects mainly rosebushes, apple trees and pear trees. Tree blight can survive the winter season by living under the bark of the host tree. Fire blight can destroy a crab apple tree and can attack various areas simultaneously. Fire blight, or tree blight, is a disease that attacks blossoms and flowers on crab apple trees; it then generally spreads through twigs and up branches to the trunk. The name “fire blight” comes from the discoloration of the blossoms and twigs which appear burned after being infected. The disease is often first found in older wood on the crab apple tree. Bacteria causes fire blight. The bacteria infect the tree through open wounds, cracks, insect-bored holes or natural openings. Fire blight can be transmitted through pollinators such as bees, birds, insects or animals; it can also be spread through rain splashing from one plant to another or from an infected plant touching another plant. Gardeners can pass the bacteria by setting unsanitized tools against the tree. Look for signs of fire blight during late spring or early summer during wet and warm weather. This is when the bacteria emerge. Look for signs such as wilting blossoms turning brown-black; twigs and branches blackening and curling up into a shepherd's hook-shape at the end; leaves turning brown-black and remaining on the tree. Seek out the small, sunken reddish-brown cankers where the discoloration stops. Often this is found at the base of a shoot, twig or branch. Smelling a foul odor should alert you to look for a clear liquid discharging from old cankers. Notice if the effects are low on the tree, such as around the root collar or lower trunk; this means the bacteria is in the tree and is likely fatal. Removal of infected twigs and branches is the best treatment for crab apple tree blight. Do this when the tree is dormant during dry weather. Prune 12 inches past the blighted area on branches; sterilize the tools using a 70 percent alcohol solution between each cut, and burn the wood. Apply an antibiotic spray during blooming season, as recommended by the Cornell University's Integrated Pest Management Program. There is no known actual cure for fire blight, according to the Colorado State University's Extension service. 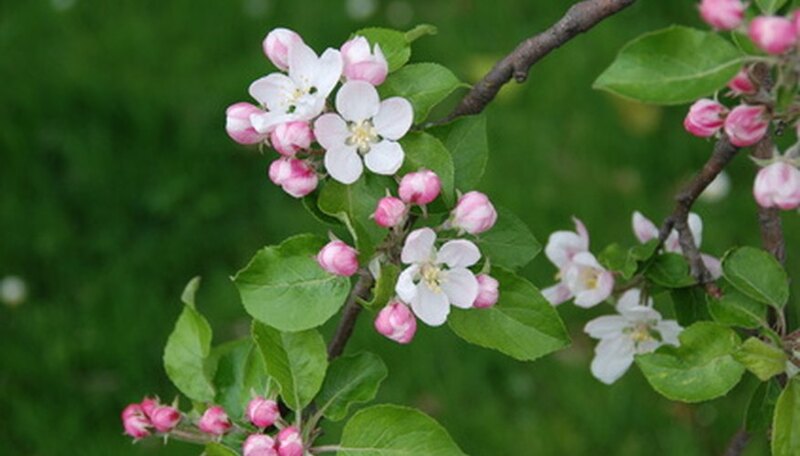 Plant crab apple varieties that are known to have some resistance to tree blight. Minimize the use of nitrogen fertilizers because they cause rapid growth; this rapid growth is what fire blight attacks and how it can spread quickly. Remove root suckers; these are upright shoots found at the base of the tree. Remove water sprouts; these are upright shoots found on branches.